A.J. Fernandez and his father, Ismael, have come together once again to produce another masterpiece. 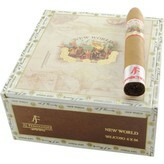 The New World Connecticut is a medium-bodied cigar which was introduced in 2015. Cigar lovers, when smoking a New World Connecticut, will experience a delightful creaminess with subtle hints of nuts and leather throughout. This is due to the USA grown Connecticut Shade Wrapper, San Andres binder and Nicaraguan long filler tobaccos. An incredibly tasty smoke which is sure to enthrall!